The MK 4/CCM 4 is optimized for maximum rejection of rear-incident sound. 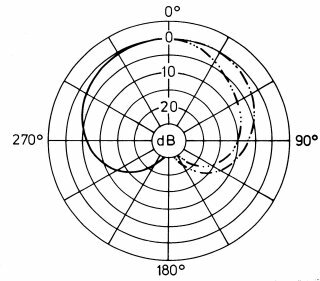 Typical of the classic cardioid, at 90° to its axis the attenuation is 6 dB, while from the rear (180°) it can be as much as 30 dB, depending on the frequency. The random-energy efficiency of the MK 4/CCM 4 -- the ratio of its on-axis sensitivity to its diffuse soundfield efficiency -- is 4.8 dB. The higher this figure, the less room sound is picked up by the microphone, and the less susceptible it is to acoustic feedback. Due to its directivity the MK 4/CCM 4 can be placed 1.7 times farther from the sound source than can a pressure transducer of equivalent sensitivity, while maintaining the same ratio of direct to reverberant sound. In the diffuse soundfield (distant from a sound source in a room, for instance), the MK 4/CCM 4 has a flat frequency response except for a slight emphasis around 10 kHz. It is ideal for speech as well as for music recordings, with a well-defined sound image free of coloration. When used for X-Y recording or as a Mid microphone in a Mid-Side configuration, it delivers exceptional results. It is also the capsule intended for use with our "ORTF Stereo" microphone (MSTC 64 or STC). In all respects, the MK 4/CCM 4 is a universally usable microphone capsule.